NETWORK FINALS: The unimpressive start for RISE got worse, as it fell 0.1 in final numbers. (FOR THE PEOPLE stayed as is.) There were 0.1 bumps for THE VOICE, THIS IS US, the 9:30PM BLACKISH, and NCIS. CABLE HIGHLIGHTS: USA’s WWE SMACKDOWN jumped 0.16 to 0.91, and UNSOLVED ticked down to 0.40. The NCAA TOURNAMENT has begun, with both of the play-in games on Tru, at 0.64/0.36. Bravo’s REAL HOUSEWIVES OF BEVERLY HILLS rose 0.07 to 0.57, and BETHENNY & FREDRIK was up 0.04 to 0.25. On HGTV, FIXER UPPER slipped 0.02 to 0.55, HOUSE HUNTERS dropped 0.06 to 0.32, and HOUSE HUNTERS INTL was down 0.12 to 0.25. MTV’s THE CHALLENGE edged up 0.02 to 0.50, with a lead-out episode of FEAR FACTOR at 0.17. OWN’s THE HAVES AND HAVE NOTS gained 0.05 to 0.49, and lead-out THE BOOK OF JOHN GRAY was at 0.15. It was CNN’s night in cable news, tying the demo lead with 0.43/0.59/1.8M, along with MSNBC’s RACHEL MADDOW SHOW at 0.43/0.63/3.4M, and Fox News’s INGRAHAM ANGLE behind at 0.32/0.53/2.7M. On History, CURSE OF CIVIL WAR GOLD dropped a tenth to 0.43, and FORGED IN FIRE returned at 0.41. TBS’s THE DETOUR was up 0.03 to 0.39. Paramount’s INK MASTER ticked up to 0.38. 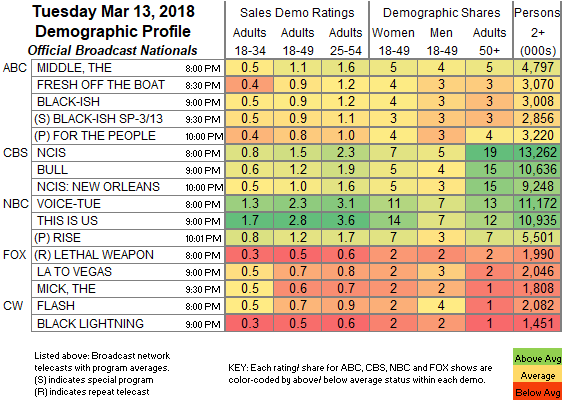 Lifetime’s MARRIED AT FIRST SIGHT jumped 0.12 to 0.37. Food Network’s CHOPPED also had a healthy 0.11 leap to 0.36. VH1’s AMERICA’S NEXT TOP MODEL gained 0.05 to 0.35. 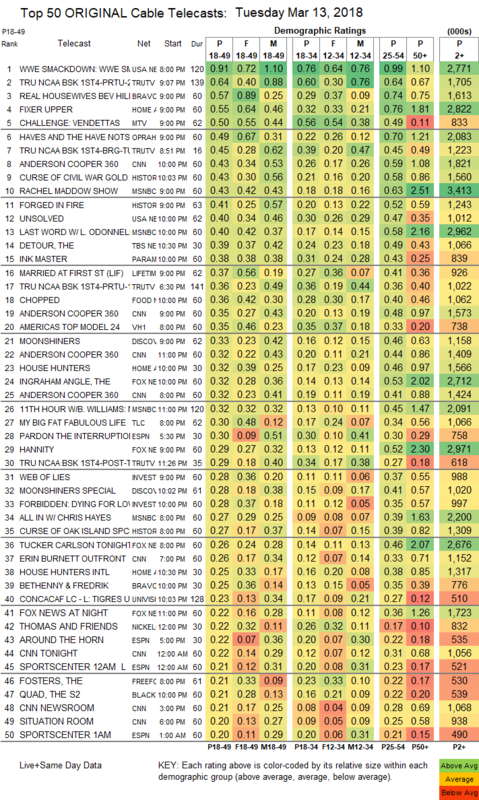 Discovery’s MOONSHINERS ticked down to 0.33, with a follow-up hour at 0.28. On TLC, MY BIG FAT FABULOUS LIFE ticked up to 0.30. On ID, WEB OF LIES arrived at 0.38, and FORBIDDEN was at 0.28 as well. The 2-episode season finale of THE FOSTERS was at 0.21/0.17, compared to last week’s 0.18. BET’s THE QUAD gained 0.03 to 0.21. FX’s BASKETS climbed 0.03 to 0.15. Comedy Central aired back-to-back episodes of ANOTHER PERIOD at 0.14 and 0.06/167K , compared to last week’s 0.16. A&E’s UNDERCOVER HIGH held at 0.14. The finale of WGNAmerica’s BELLEVUE was steady at 0.03/184K.